Not to take away from the commitment & fearlessness of this protester who stands half-dressed before tear gas & pellet guns, but the lone male protester typifies all media coverage of the Palestinian struggle & now models coverage of the Kashmiri struggle. 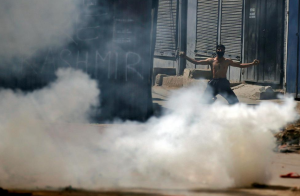 According to several reports & photos on social media from Kashmiri sources, there are massive protests all over Kashmir every day. Some are funeral cortege/protests for the many who’ve been killed but all are defying the curfew to protest against the occupation. The media representation of lone male protesters, often hurling rocks, is a tendentious & insidious way to buttress Israeli & Indian government claims that resistance to military occupation is by a minority of violent, nihilistic, antisocial terrorist youth & not political resistance of tectonic social dimensions. The popular character of resistance is seldom portrayed outside of social media. Try to remember the last time you ever saw a photo or read a story in any major media of massive protests in either Palestine or Kashmir. A lot of people sniff at mainstream media & even claim they won’t read or watch it. I don’t know how you understand what’s going on in the world if you don’t. Osmosis? The local fortune teller? To my mind, alternative media is just as problematic, if not more. And it is certainly more long-winded. Some of them must get paid by poundage of words. The chief problem is that they are trusted less critically than mainstream media when they are often just as unreliable. Truth of the matter is, if you want to unravel complex issues, you have to use the library. You have to read books because media is not sufficient. If I had one suggestion on how to read media, it would be to study history. Of course scholarship is also tendentious & on many issues, at least in US libraries, completely shoddy. I have several experiences with that, including in the past few years trying to find good scholarship on Kashmir. In the late 80s & early 90s when the US conflict in Somalia first broke out, I scoured the libraries & book stores in Boston–including the Harvard University library which outsiders could use–& was unable to find a single book about that country or the conflict. That paucity of scholarship would be true for almost every African country–when understanding Africa is becoming very important for several reasons: the flight & refugee crises from African countries; the environmental destruction by multinationals; the neoliberal capitalist policies destroying the infrastructures & very matrices of entire societies; the outrageous plunder; the military buildup there by US & other military forces. The scholarship situation may not be so dire in other parts of the world but it certainly is in the US. As we know from the Syria disputes, the question isn’t just information about what is happening but interpretation of what is happening, what political viewpoints writers represent–& you have to read a lot to evaluate how reliable the sources, the methods of analyses, the political connections & loyalties. There’s no shortcut to understanding except leaving out media that you know is full of baloney all or most of the time. I’ll be 72 next month & it took me most of that time to understand this so you’re getting a bargain on my insights. Use them wisely. Or you can just tell me to shove off. But isn’t that what they’re doing in North Dakota?